I thought I’d post quickly to answer some of the comments and questions left on my maintenance post. When I bought my new sewing machine a couple of years ago, dear Joe, the shop owner, included a package of vacuum attachments so I could clean the machine betwixt servicings. I must say, the first time I used this to clean all the fabric fluff and lint from my machine was quite the revelation. These little attachments work like a charm cleaning out all the teeniest crevices in my machines in the most efficient way. It’s quite fun watching the lint disappear! I had often seen kits like this hanging in sewing machine shops, but walked right past them without a second glance. I couldn’t bother buying one, and now that I have one, cannot understand why I didn’t purchase one years ago. It probably would have made for happier sewing machines in my house. 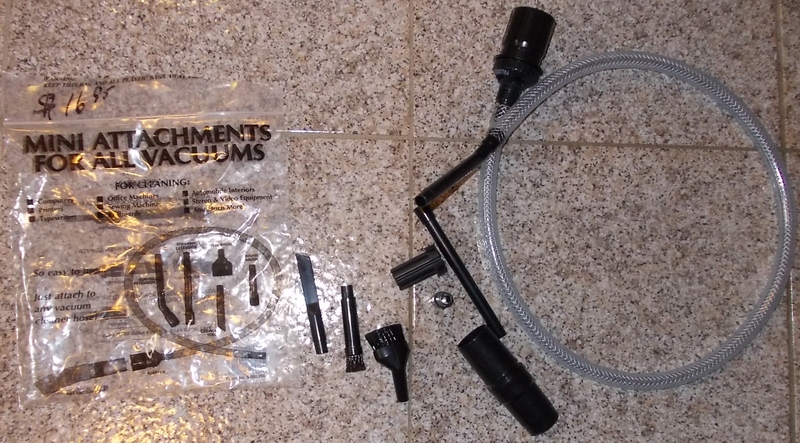 Anyhow, for those of you who’ve never seen such itty-bitty vacuum attachments, here’s a couple of links for online sources should your local store not carry anything quite like this! And I saw several for offer on Ebay, too. Happy sewing machine cleaning, everyone! Brilliant! I vacuumed my serger out the other day using my household vacuum nozzels and it just wouldn’t do. Thank you for the links and details :o) from the bottom of my SMs hearts.